Boston University hockey fans have reason to tune into the NHL Draft when it begins on June 22 in Dallas. After a successful freshman campaign with the Terriers, forward Brady Tkachuk is expected to go as high as third overall and is the second-ranked North American skater in the draft according to NHL.com. 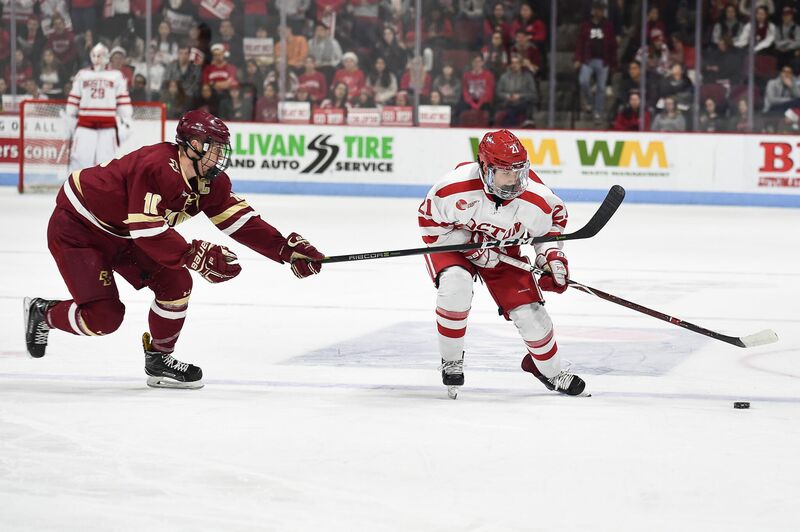 Tkachuk has not ruled out returning to the Agganis Arena ice for another go-round in Hockey East, but being a top-five selection would make it difficult for the physical winger to return to college. The 6-foot-3-inch, 197-pounder was one of the Terriers’ most active contributors on the offensive end all season. He led the team with 23 assists and 131 shots, the most of any freshman in the country. His +15 plus-minus was the second-best on the squad and his 31 points were the fourth-most. His performance on the ice was rewarded following the season, as he was named a member of the Hockey East All-Rookie Team. Tkachuk was a prime example of former head coach David Quinn’s recruiting prowess. Quinn had seven players selected in the 2017 NHL Draft after seeing four of his pupils selected in the first round of the 2016 NHL Draft. Tkachuk serves as one of the final gems of Quinn’s recruiting legacy, one which concluded when he accepted the head coaching job with the New York Rangers last month. Quinn’s new hockey club holds the ninth pick, but Tkachuk will likely be swiped off the board by then. The two-time Hockey East Top Performer could join former Boston Bruins head coach Claude Julien in Montreal. The Canadiens have expressed interest and Tkachuk’s NHL-ready body provides him with the ability to assist a talent-depleted Montreal roster sooner rather than later. Another potential landing spot for Tkachuk is Arizona. The Coyotes are another team in need of a boost, as they have not made the playoffs since 2012. Multiple Phoenix media outlets have conveyed general manager John Chayka’s interest in selecting Tkachuk, who would be joining former Terrier Clayton Keller on a club which accumulated the fewest points in the Western Conference in 2017-18. Unlike past seasons, BU will not have a collection of players waiting to hear their name called on draft night. Funny enough, the majority of the Terriers front-line performers have already been selected in previous years. In 2017, Cam Crotty was picked by the Coyotes, Kasper Kotkansalo was selected by the Detroit Red Wings, David Farrance by the Nashville Predators, Logan Cockerill by the New York Islanders, Shane Bowers by the Ottawa Senators and Jake Oettinger by the Dallas Stars. A year prior, Chad Krys went to the Chicago Blackhawks while Dante Fabbro and Patrick Harper both landed with the Predators. Take away Tkachuk, and the Terriers still have loads of NHL-level talent projected to be on the 2018-19 roster. In terms of the players who have not been drafted, there is not too much chatter surrounding Beanpot hero Ty Amonte despite his name being floated around in draft speculation last summer. BU will likely have another first round pick in addition to Tkachuk. Incoming freshman forward Joel Farabee is listed as a likely first-round pick. The Cicero, New York native is ranked number 12 among North American skaters and mock drafts have him within the first 15 picks. Boston Hockey Blog Draft Prediction: Top 10-15 pick. Farabee won’t have to look too far to see another future Terrier being drafted, all he really needs to do is look to his right as his linemate with the USDP Jake Wise. Wise is expected to be the second future Terrier and third Terrier overall being drafted this season. BU has one other incoming freshman who might hear his name called. Ranked number 166 among North American Skaters is Jack DeBoer. Although he is the son of the head coach of the San Jose Sharks, he is not a lock to be drafted. 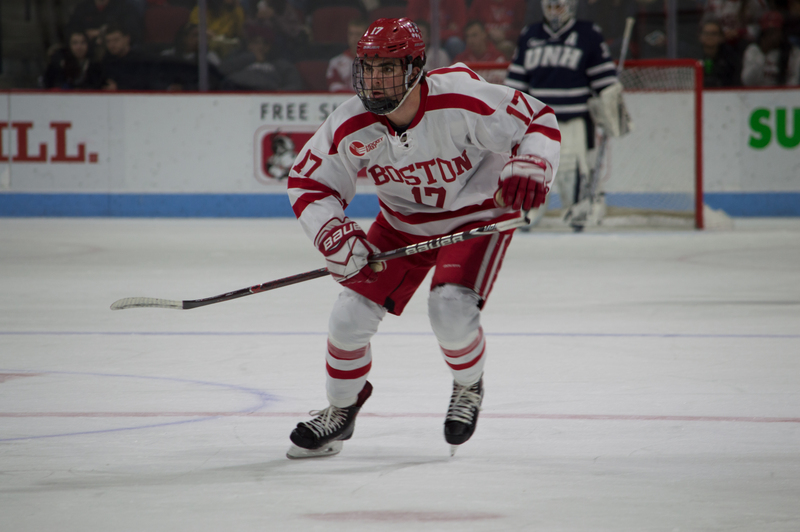 For a point of reference, current Terrier senior forward and captain Bobo Carpenter was ranked 119 among North American skaters for the 2014 draft and went undrafted. It certainly has been a tale of two seasons for the No. 13 Boston University men’s hockey team — and it is not over yet. After facing off against No. 4 Cornell University 3-1 Saturday afternoon in the NCAA Northeast Regional semifinals at the DCU Center in Worcester, the Terriers (22-13-4, 12-8-4 Hockey East) downed Cornell (25-6-2) 3-1 in a rematch of November’s Red Hot Hockey game. Freshmen forwards Shane Bowers and Logan Cockerill as well as freshman defenseman David Farrance all found the back of the net in the win against the Big Red. On Sunday in the regional finals, the Terriers will take on the No. 10 University of Michigan for the ninth time in the NCAA tournament, which marks the most times BU has played a single opponent in the tournament of all time. The Wolverines (21-14-3) knocked off No. 8 Northeastern University 3-2 yesterday, thanks two goals from junior forward Cooper Marody and one from senior forward Dexter Dancs. The game will feature a total of 19 players currently drafted by NHL teams with the Terriers having 12 on their roster and the Wolverines sporting seven. However, both teams also have a top-four rated North American Skater for the NHL draft in BU’s freshman forward Brady Tkachuk and Michigan’s freshman defenseman Quinn Hughes, who are ranked third and fourth, respectively. Although they will be facing off against each other Sunday, Hughes and Tkachuk were teammates during the 2018 IIHF World Junior Championship for Team USA. 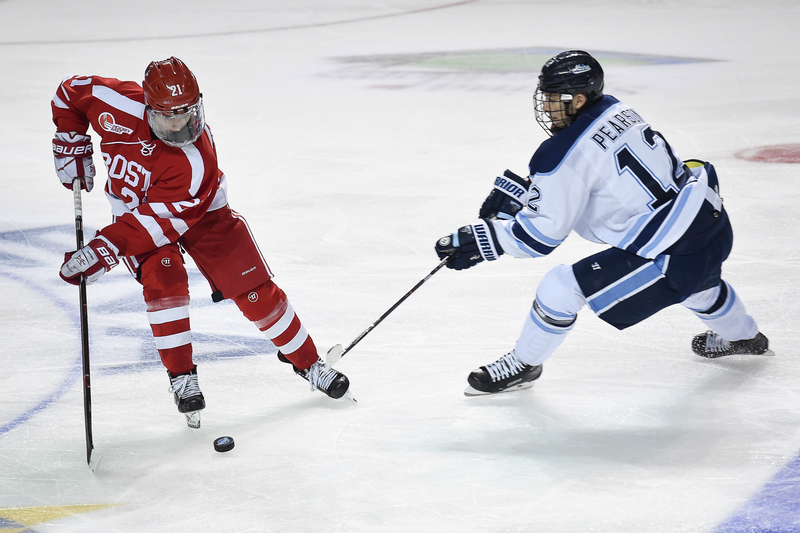 Both the Terriers and the Wolverines sent three players to the international tournament. For BU, sophomores goaltender Jake Oettinger and forward Patrick Harper. In addition to Hughes, Michigan sent forwards sophomore Will Lockwood and freshman Josh Norris. Tkachuk outscored the three Wolverines in that tournament 9-6. Since returning from the tournament on Jan. 6, Oettinger boasts a 1.96 goals against average and a goal save percentage of .931, which puts the Lakeville, Minnesota native 11th in the nation in both categories. The first round Dallas Stars prospect has played extremely well since the start of the Hockey East Tournament on March 9. During the last five games, the netminder has posted a .949 goal save percentage and a goals against average of 1.69, which puts him fourth and 12th in the country respectively. BU will look to him to stop a Michigan offense that ranks ninth in the country averaging 3.34 goals per game, which is led by Marody who has 48 points. The Wolverines have seven players more than 20 points and two with 40 or more. Although BU does not have a single player on their roster with 40 points, it has four players with 30 or more points and a total of eight players with 20 points or more. Junior forward and assistant captain Bobo Carpenter leads the Terriers in points (35) and goals (20). Michigan will turn to sophomore goaltender Hayden Lavigne to slow down the Terriers offense. He current sits on a .910 goal save percentage and a 2.76 goals against average of 2.76 while picking up one assist. 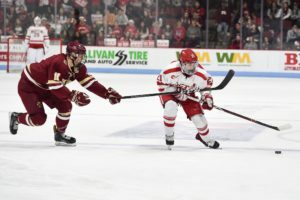 BU is playing in its third regional final in the past four years, which matches the University of Denver and the University of Minnesota Duluth as the only teams to do so. With a victory over the Wolverines, the Terriers will find themselves in the Frozen Four for the first time since the 2014-15 season where they fell to Providence College in the National title game. It’s been three years since the No. 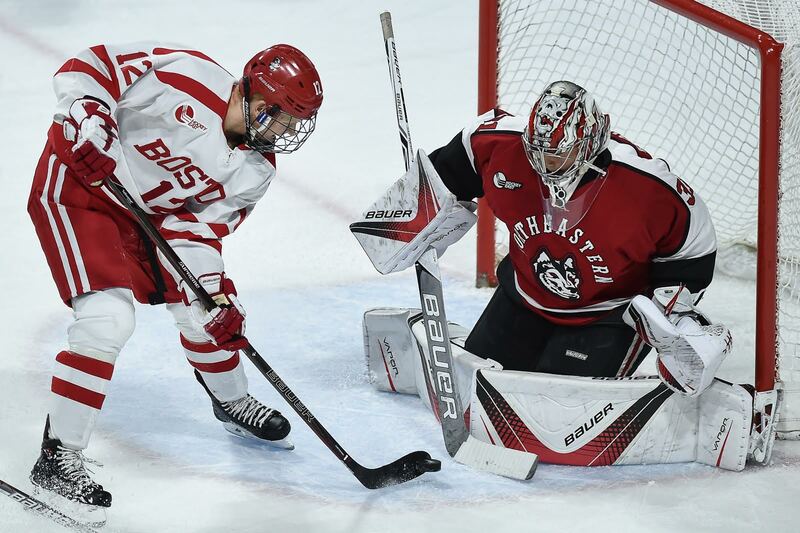 18 Boston University men’s hockey team faced No. 9 Providence College at TD Garden. In that game, the Friars (23-10-4, 13-7-4 Hockey East) overcame Hobey Baker Memorial Award winner Jack Eichel and downed BU (20-13-4, 12-8-4 Hockey East) to take home the school’s first national championship. For the Terriers, the options are simple: with a win they secure a spot in the NCAA Tournament, but with a loss, their season is over. BU’s season almost ended Friday night at the hands of No. 14 Boston College. The Eagles (20-14-3, 18-6 Hockey East) jumped out to a 2-0 lead by three minutes and 26 seconds into the second period. 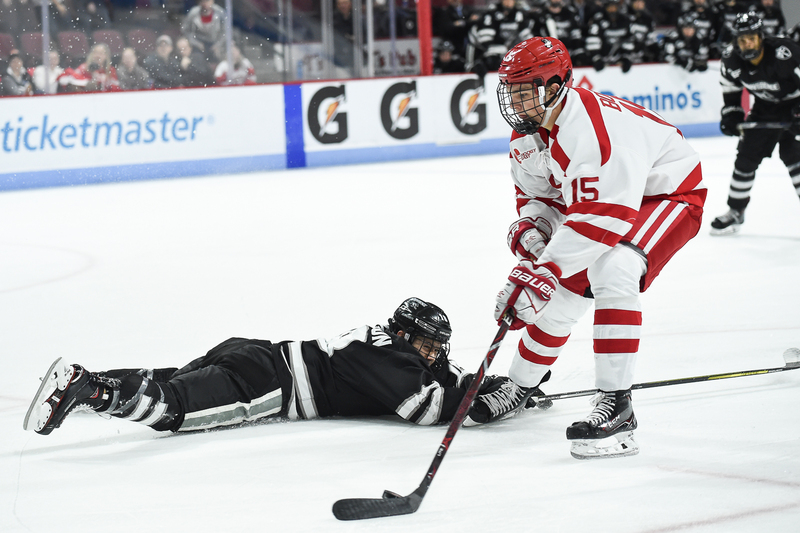 However, the Terriers battled to send the game into overtime, where sophomore forward Patrick Curry cleaned up a rebound from freshman forward Shane Bowers 15:40 into the extended period to send BU to the championship game. The Terriers have remained undefeated (13-0-2) in games where Curry has notched a point. The Friars also needed overtime to put themselves in position to win their first Hockey East crown since 1996. In a battle of two top-10 teams, Providence overcame No. 7 Northeastern University 2-1 in overtime. The Friars jumped out to a 1-0 lead in the first period, but the Huskies (23-9-5 15-6-3 Hockey East) knotted the game in the second period thanks to a short-handed goal by senior forward and assistant captain Dylan Sikura. Freshman forward Austin Goldstein and sophomore forward Kasper Bjorkqvist each tallied goals for Northeastern and Providence, respectively, in the third period, but sophomore forward Brandon Duhaime scored the game-winner for the Friars 9:55 into overtime. BU and Providence split the three regular season games evenly at 1-1-1, with both wins coming from the home team. Sophomore defenseman Chad Krys picked up three points against the Friars, including a two-goal game at Agganis Arena on Nov. 3. Junior forward and assistant captain Bobo Carpenter also recorded a two-goal game against Providence at Agganis on Jan. 13. The Friars are led by Hockey East First-Team All-Stars junior forward Erik Foley and sophomore defenseman Jacob Bryson. Foley recorded two goals against the Terriers this season. In net, the Friars feature Hockey East All-Star Second Team member junior goaltender Hayden Hawkey — who shutout BU earlier this season at Schneider Arena. He will be tasked with stopping a BU offense that averages 3.14 goals per game, a mark that is good for second in the conference. Hawkey’s netminding counterpart, sophomore goaltender Jake Oettinger, also recorded a shutout in the series on Nov. 3. The Terriers will rely on the Lakeville, Minnesota native to slow down a Providence team that is third in the conference in scoring, as the Friars average 3.11 goals per game. After last Saturday’s win against the No. 11 University of New Hampshire, the No. 18 Boston University men’s hockey team has officially made it through the first third of its 36 regular-game season. The Boston Hockey Blog decided to compile an infographic on the team’s progress so far. We’ve also elaborated on some of the information in the graphic below and added things that couldn’t fit. BU was slated as No. 2 behind University of Denver in the preseason poll, and kept this standing as it beat Union 4-1 during its home-opener and Quinnipiac University 4-3 in overtime. However, a sweep by Minnesota State University caused the Terriers to drop to No. 7. The following weekend, BU split its series against UConn and moved up a spot. After losing to both the Denver and Providence College, the Terriers went to No. 12. 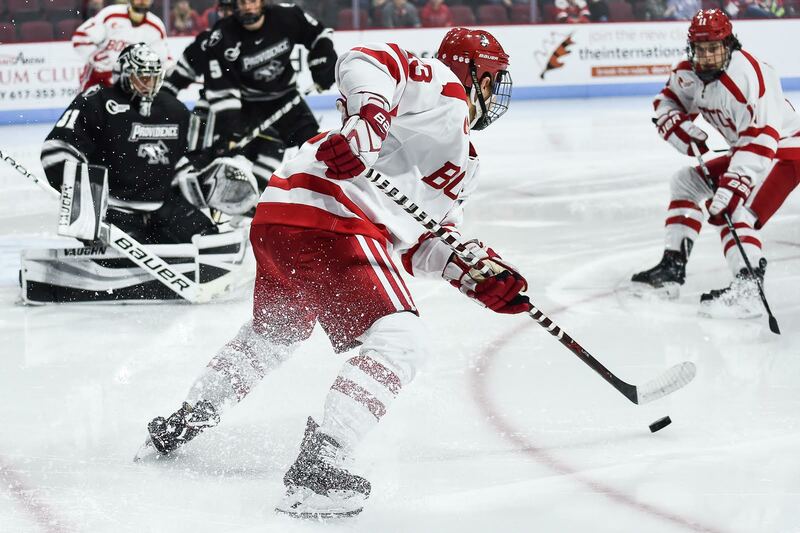 The following weekend, BU split its Hockey East matchups after a win against Providence, but a loss to Northeastern, causing it to drop to No. 15. Finally, despite beating UNH, the Terriers were swept by Northeastern giving them a No. 18 spot in the polls. Junior forward Bobo Carpenter has scored four of his seven goals while BU was on a power play. Carpenter scored two short-handed goals against UConn on Oct. 20. After this weekend’s series against the University of Maine, the Terriers will only have five more games left before the end of the semester.